The key advantages of using 3D/VR technologies are that they could not only allow the learners look at the objects from different perspectives but also help to eliminate the learners' misconception or illusion arising from the projection of the real 3D objects onto flat 2D photos or drawing. Some technologies can provide a sort of almost first-person experience to the learner by allowing the learner to manipulate the objects freely in the three-dimensional space. Left photo: Demo by a Science student to Dr. Pang on the use of 3D Photo Objects to study the structure of flowers. Some 3D and virtual reality technologies require the wearing of certain spectacles (e.g. LCD shutter glasses) for acquiring the real depth perception of the objects. Right photo: Real-time recording of 3D video on a computer. Some viewing methods may induce some sort of unpleasant feeling to the viewers after prolonged viewing. Left photo: Using red-blue filter glasses to view analgyph images. 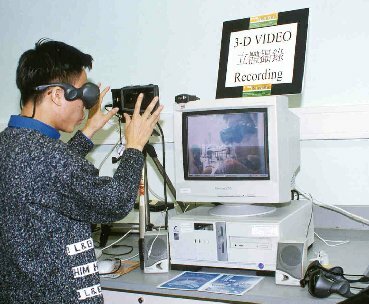 We have developed plenty samples of 3D/VR objects based on the aforementioned six types of technologies for educating the HKIEd students. Click the button below to browse some samples on the Internet. Misconception (or called alternative conception), misinterpretation or misunderstanding are easily resulted when the 3D objects (e.g. magnetic/electric field pattern, multi-dimensional mathematical functions, 3D geometry, product design or sculpture) are made in flat 2D projection (or monoscopic images which lack the depth clues) or in 3D material models (e.g. bonding misconception inherent with the sticks used in molecule or crystal models). Certain experiments, practices or demonstrations are less favorable for carrying out in real-life because they are either embedded with potential hazards or bioethical implications (e.g. dissection of human body or other living organisms) or too expensive in acquiring the necessary equipment. The processes or phenomena are almost impossible to observe or control in the real world situation because of the spatial (e.g. viewing and navigation around the Solar system) or temporal constraints (e.g. particle/atomic motion/interaction in the microscopic scale). VR can more effectively stimulate the students' interest of learning science and provide the sort of interactivity to facilitate the students' deep level of learning as they can freely explore or observe in detail on what are in doubt. 3D and/or VR resources can help to develop the students’ scientific curiosity and scientific investigation skills for developing their deep level of science learning as they can freely explore or observe in detail on what they are in doubt. 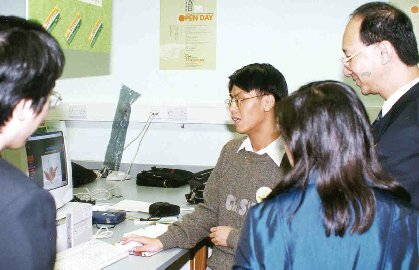 Scientific investigation has a fundamental importance in the recent science education reform in Hong Kong and in the advocacy of scientific literacy in many other countries. Furthermore, those resources can be used as concrete examples for HKIEd students to acquire first-person experience in virtual reality when they study the relevant topic in the Science, Technology and Society modules offered in various Bachelor of Education programs. The same resources could also be adapted to teach the new Science and Technology subject for the local Secondary 4 and 5 pupils in science or arts streams. Copyright (C) 1999-2019. HKIEd HAS Centre. All Rights Reserved.